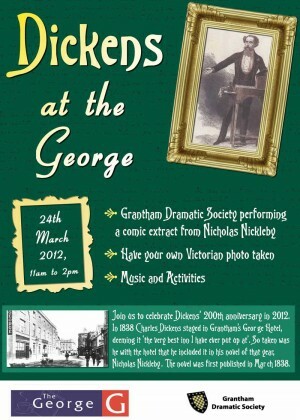 Grantham Dramatic Society and The George shopping centre are working together to celebrate the 200th anniversary of the birth of Charles Dickens with the event 'Dickens at the George'. On 24 March between 11am and 2pm, Grantham Dramatic Society will be performing a comic extract from 'Nicholas Nickleby' at the George shopping centre in Granthams everal times during the day. In 1838, Charles Dickens passed through Grantham on his journey north, researching school conditions for his novel 'Nicholas Nickleby'. He stayed at the George Hotel (now the George shopping centre) which he mentions in 'Nicholas Nickleby', immortalising it forever. Elaine Bishop will be singing Victorian-themed songs while shoppers will be able to have their own Victorian style photo taken in our studio and take part in other Victorian activities.